As you can see it barley touches it at times because there is only a little scratch on the case saver. But don't know if this can cause it to snap or is dangerous or if I should just let it completely groove itself out then replace the chain? Also the case savers inside edge sits directly in the middle of the chain is this normal or is it supposed to cover the whole width of the chain? Like do I need a spacer to move the sprocket out a little more? 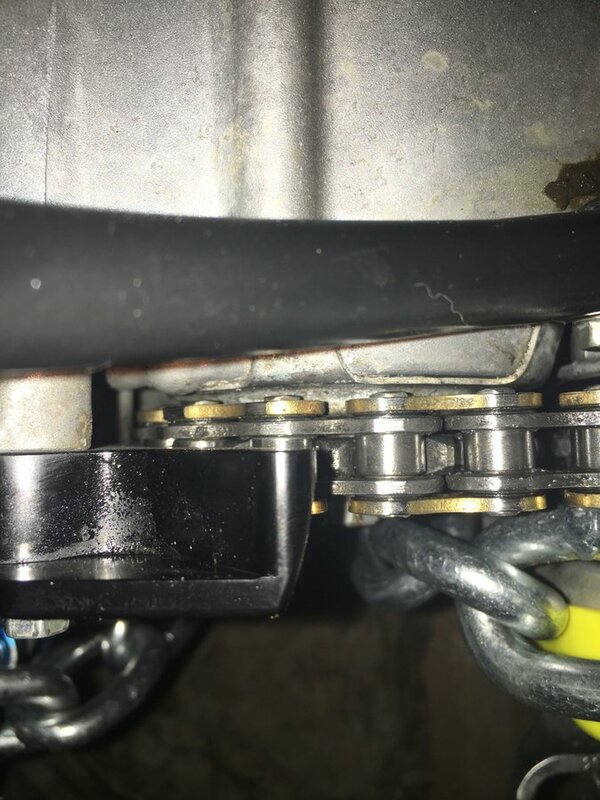 Also how far into the chain rubbing block on the swingarm can the chain go before I need to replace it? All that black dust seems to have come from the chain and case saver. what else is wearing the chain ? This is the rear chain slider I’m guessing, how does it look? if the chain hasnt chewed its way thru the plastic yet - its ok - what about the front slider ? This is the front slider. Both front and rear still have plastic. I don’t know what you mean by “master link hasn’t full seated link pin groove”? Is this supposed to be off center like this? I think I see what you mean. So do I just need to clamp it down hard to make it pinch all the way? Or is it toast and need a new one? It also looks like you may have some adjustment room on your hammerhead guard. If the mounting holes are oval (like what appears in this pic), can you loosen your top bolt, and move the guard a couple more millimeters away from the sprocket? But now just wondering if my chain is compromised or if I can still use it? I’d hate to spend money getting new sprockets and chain if I don’t need too but maybe should just to be safe? Also still trying to figure out if my front sprocket is too far inside? I feel like the case saver is only covering half the chain width and is right behind the case threads for the case saver and would still hit the case? If y’all couldn’t tell I’m kinda stupid and know nothing but am really trying to learn. So the clip was in fact in the grooves it just didn’t look like it cuz as you can see the top side of the pins are worn out to 45° angle on the top but still good on the bottom. I took the master link off and put it back on and made sure the clip is in the grooves. But the actual clip itself seems a little spread out on the open side, I’ve tried to pinch it shut as best I could. Does it look ok or am I pushing my luck and should just get at very least a new master link? I also took my chain off and tested for chain wear and the chain seems fine. It doesn’t bend sideways barley, no kinks or week pins, and it doesn’t budge off any of the rear sprocket teeth. So other than the master link clip and the top of the chain flattened a little bit it seems fine? What do you think? Get a new master link and clip... cheap insurance. Yea I just realized how cheap, I didn’t know they were less than $5! My local shop has a few and I will pick one up first thing on the morning. Hopefully they can reassure me my chain itself is fine while I’m there with my bike. They seem to be pretty good people so hopefully they don’t try to up sell me on a whole new chain too if I don’t need one. But I probably will buy one if they say so. Sounds like you tested the chain... I wouldn't sweat that. Master link looks beat and the clip is sketchy. Buy one for the chain and a second for the toolbox.